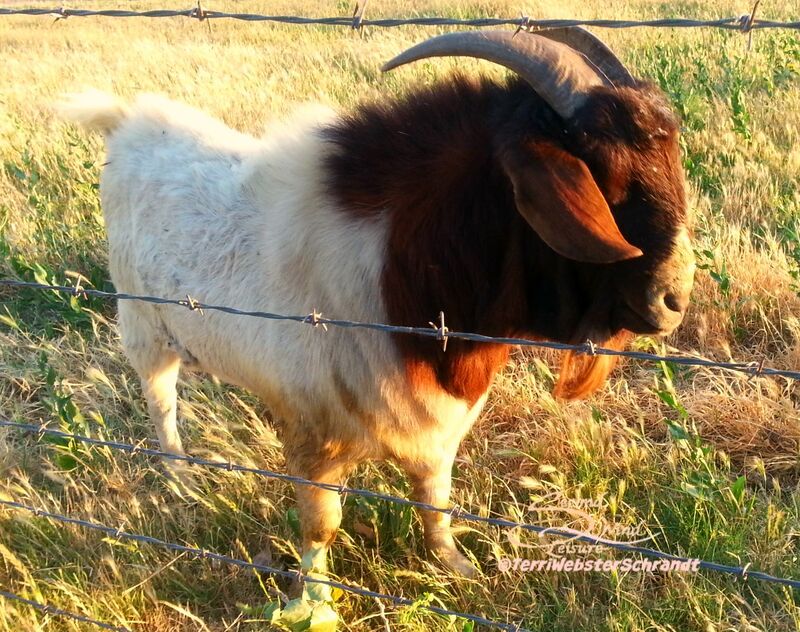 Once upon a time, there was a lonely, but friendly goat who walked into the cow pasture. He found himself standing next to a barbed-wire fence that separated him from…people! Oh how he loved people! A lady walked over to the fence and saw the goat. He was a big billy goat with beautiful cream and brown coloring. When she got closer, she saw that his face was covered with stickers and foxtails. She gently plucked them off, patted his head and went back to her humble abode. The lady told her next door neighbor about the goat and they both chuckled at the goat’s bravery and his rather gamey odor. Later that day, the lady noticed that the goat was still wandering near the fence. Back at her home, she became aware that the goat’s gamey odor seemed much stronger than usual, thinking that he must be standing perfectly upwind. Looking outside her door, she suddenly saw the goat standing next to her picnic table! 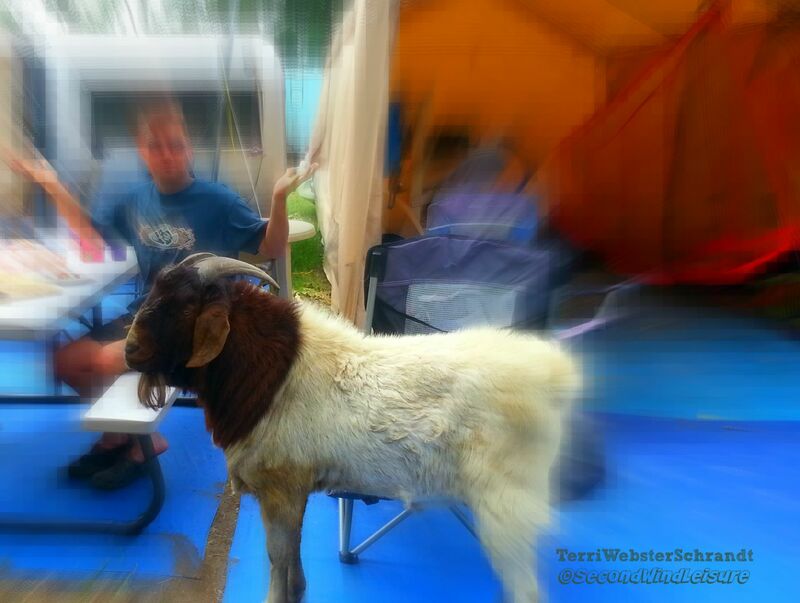 Billy the goat (yes, very original), decided to visit our windsurf campground, and yes, I really did pluck the foxtails off of his face. Apparently, he bonded with me and managed to squeeze through the fence and visit our camp. My next door neighbor was eating lunch when Billy came to visit. Billy decided to walk around and start chewing on the material of some of the sail tents which made some of the other campers angry. Some of the men started chasing Billy back to his pasture, loudly joking that they were going to kill him and have a BBQ. Some of the moms voiced concerns that the goat might hurt their children. Rolling my eyes as the city slickers chased the poor farm animal, I ran alongside. Someone had a rope and looped it around his neck. Someone else tried to pull on the rope to move Billy along, but he refused to move. A little perturbed at my friends’ reactions to the goat, I walked over to Billy, patted his head and picked up the rope, gently leading him to the pasture from where he came. He docilely walked along and let me tie him to the gate post. Meanwhile, someone had called the rancher who owned the adjoining property to report the goat. Frustrated, I grabbed my stand-up paddleboard and went for a short paddle session. About 20 minutes later, I saw the rancher’s cattle trailer pulling into the driveway of the campground. I watched from afar as the ranchers attempted to put Billy in the trailer. He did NOT want to go and attempted to ram the one fellow! As I hurried back to the campground, I saw Billy finally being put into the trailer. I ran toward the driver and told him that Billy meant no harm and not to hurt him. He assured me that they were just going to take him back to his own pasture, which was two miles away. I said that Billy was a very nice goat, very tame and just seemed lonely. They smiled and began to drive away. And Billy lived happily ever after with his goat friends in his own pasture. Billy the friendly goat bears the very colors featured in Cee’s Fun Foto Challenge: Cream and Brown. I am so glad that this story ended well and thanks to your kindness and care, Billy was able to get back to his pasture, safe and sound. I’m glad his owner assured nothing would happen to him. Poor little guy that he felt lonely! I remember you had told us about having ridden horses for years so that experience definitely helped you with this little guy! Hope all is well with you! I’m having a nice vacation but it’s back to work this week. Oh well, at least the summer temps are still around! Enjoy your trip, Terri! Mine was a “staycation” at home but I enjoyed the beach, day trips and sleeping in late! Have a great time and sending my best to you ! You gotta have a happily ever ending for Billy! I think it is wonderful that Billy bonded with you and you were able to handle him. I just love happy endings. A lovely story on how animals response to kindness. My entry this week. What a wonderful story Terri! Love poor Billy!! Lovely gesture of kindness to Billy. You are a lovely person, Terri. Terri, what I liked the most was to notice that people show their best or worse when opportunity arises for them to act unmasked. You were you, no surprise. Generous , affectionate, caring, selfless. So proud of you. The goat felt safe with you. Hope the goat is well. Aww! We had a goat that wandered into our pasture once. He was just hanging out with the cows. It was funny because I always joked that we needed a goat. We liked to watch him frolic in the field. He disappeared one day, we never did find out where he came from. P.S. I thought You were going to reference Julie Andrews- the Lonely Goatherd song! I almost did but did not want to be too gauche. 🙂 sad that your goat disappeared. Thanks for watching out for the goat! Great photos. This challenge won’t start until Next Tuesday. I’m traveling so I had to post for today. Interesting story, that reminds me of an African story about a goat and a sheep travelling together. I will soon post that story. Aww, Billy! I love that you treated him so gently, when others weren’t! I hope he lives a good life back at his ranch.